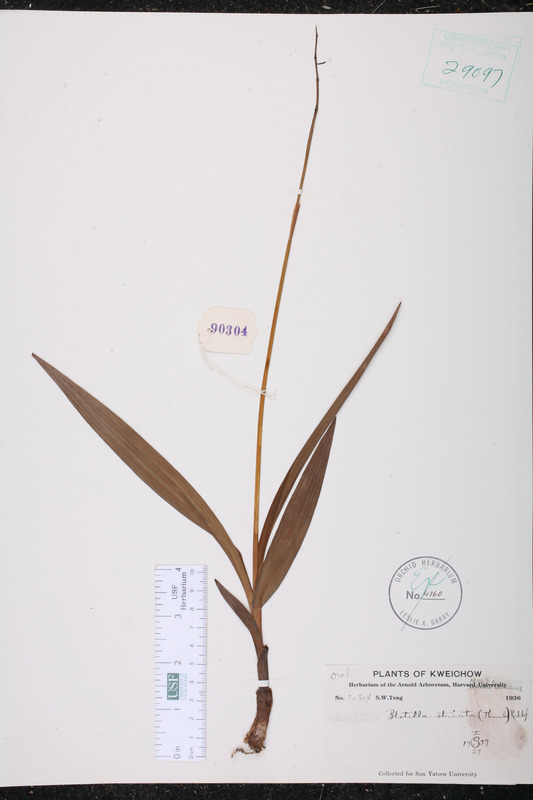 Species: Bletilla striata (Thunb.) Rchb.f. 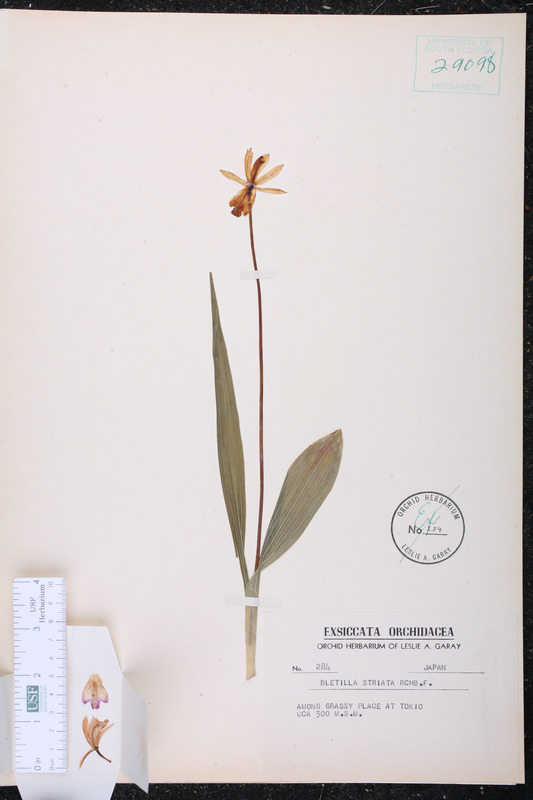 Citation BLETILLA STRIATA (Thunberg) Reichenbach f., Bot. Zeitung (Berlin) 36: 75. 1878. Basionym: Limodorum striatum Thunberg 1784. Bletia striata Bletia striata (Thunberg) Druce, Bot. Soc. Exch. Club Brit. Isles 4: 609. 1917. BASIONYM: Limodorum striatum Thunberg 1784. Cymbidium striatum Cymbidium striatum Swartz, Nova Acta Regiae Soc. Sci. Upsal. 6: 77. 1797. BASIONYM: Limodorum striatum Thunberg 1784. Epidendrum striatum Epidendrum striatum (Thunberg) Thunberg, Trans. Linn. Soc. London 2: 327. 1794. BASIONYM: Limnodorum striatum Thunberg 1784. 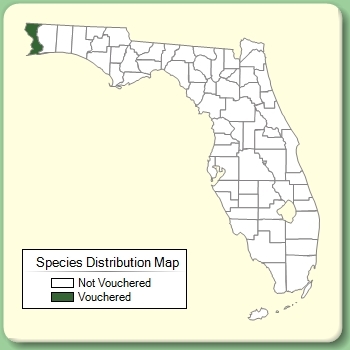 Jimensia nervosa Jimensia nervosa Rafinesque, Fl. Tellur. 4: 38. 1838 ("1836"), nom. illegit. BASIONYM: Limodorum striatum Thunberg 1784. Jimensia striata Jimensia striata (Thunberg) Garay & Schultes, Bot. Mus. Leafl. 18: 184. 1958. BASIONYM: Limodorum striatum Thunberg 1784. Limodorum striatum Limodorum striatum Thunberg, Fl. Japon. 28. 1784. Bletia gebina Bletia gebina Lindley, J. Hort. Soc. London 2: 307. 1847. Bletia hyacinthina Bletia hyacinthina (Smith) R. Brown, in W. T. Aiton, Hortus Kew. 5: 206. 1813. BASIONYM: Cymbidium hyacinthinum Smith 1805. Bletilla gebina Bletilla gebina (Lindley) Reichenbach f., Fl. Serres Jard. Eur. 8: 246. 1853. BASIONYM: Bletia gebina Lindley 1847. Bletilla hyacinthina Bletilla hyacinthina (Smith) Reichenbach f., Bot. Zeitung (Berlin) 36: 75. 1878. BASIONYM: Cymbidium hyacinthinum Smith 1805. Bletilla striata forma gebina Bletilla striata (Thunberg) Reichenbach f., forma gebina (Lindley) Ohwi, Bull. Natl. Sci. Mus. 33: 70. 1953. BASIONYM: Bletia gebina Lindley 1847. Bletilla striata var. albomarginata Bletilla striata (Thunberg) Reichenbach f., var. albomarginata Makino, J. Jap. Bot. 6: 31. 1929. Bletilla striata var. gebina Bletilla striata (Thunberg) Reichenbach f., var. gebina (Lindley) Reichenbach f., Bot. Zeitung (Berlin) 36: 75. 1878. BASIONYM: Bletia gebina Lindley 1847. Cymbidium hyacinthinum Cymbidium hyacinthinum Smith, Exot. Bot. 1: 117, pl. 60. 1805. Gyas humilis Gyas humilis Salisbury, Trans. Hort. Soc. London 1: 300. 1812.